The month of May brings with it the promise of summer and warmer weather, however, the change in season can also mean increased irritants for those suffering from asthma. In May, agencies across the United States take part in Asthma Awareness Month to improve the lives of people with asthma and raise awareness about this disease. According to the CDC, in Washington State, more than 9 percent of adults and 8 percent of children have asthma. About 5 percent of high school students with the disease report missing five or more days of school due to asthma. Absenteeism and health issues due to asthma affect teachers and school staff as well, and the Puget Sound Workers’ Compensation Trust is dedicated to ensuring that school environments are optimal for the health and well-being of school employees. This is an important resource for educating staff. We encourage you to forward this information to your staff, to be discussed and implemented on a district-wide basis. Aside from some industrial work areas, classrooms are the only places where there are more than 20 people in a single, small room for extended periods of time. The cumulative effects of their body functions, hygiene habits, health issues, traffic patterns, activities, and the materials used in the room can add up fast. In the majority of cases, school IAQ problems are not due to the presence of an exotic toxin or excessive mold growth, but a matrix of smaller problems that add up to or even amplify each other. As a unique environment, classrooms need lots of attention and conscientious management to be kept healthy and contaminant-free. 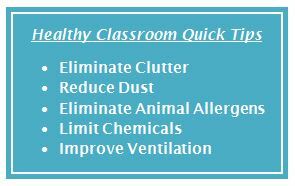 Asthma triggers such as dust, animal allergens, dust mites, and chemicals are all elements that can be present in a school environment. The following are highlights from the Trust’s IAQ Resource on actions districts can take to eliminate or reduce common asthma triggers and improve their indoor air quality. Maintain cleanable surfaces and avoid clutter. Put loose items into plastic boxes with lids that can be wet-wiped, and damp-wipe surfaces weekly with a micro-fiber cloth. Do not hang items from the ceiling T-bars without special clips to prevent fraying fiberglass, and remove or clean hanging items when they become dusty. Remove area rugs that cannot be regularly cleaned and replace upholstered furniture with furniture that can be easily dusted. Remember that animals should not be permanent classroom residents and should only come to school for educational purposes. Grate all foundation and roof ventilation. Use barriers to discourage birds from roosting. Use only chemicals, cleaners, or disinfectants provided by the district. Do not bring them from home. Do not use permanent, solvent-based, or scented pens, markers, or board cleaners. Replace with water-based, unscented, crayon-based, or low-odor items. Do not use room deodorizing sprays, plug-ins, scented candle warmers, scented reeds, candles, incense, therapeutic oils, or potpourris. Avoid spray adhesives, contact cement, and volatile paints. If spray adhesives are necessary, use hexane and toluene-free products. Wear solvent-resistant gloves. Spray in an area away from children with local exhaust ventilation. 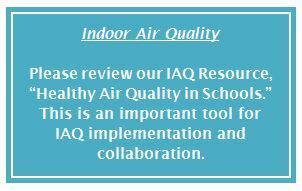 The Trust also recommends that districts implement a district-wide Indoor Air Quality (IAQ) Plan and also that those programs be headed by a well-informed contact person. This individual should serve as the first contact for concerns about a districts’ indoor air quality. Teachers and staff should be informed of who the IAQ contact is for their district, and know to contact that individual should they detect odors or dust from district locations such as shops, science labs, or custodial supply rooms, among others. Change ventilation filters regularly. Use the highest-rated, deepest pleat filters the system can accommodate. Ensure that air supply, exhaust, and return vents/grills are not blocked. They should be clean and dry. Do not turn off unit ventilators – ask maintenance staff to repair noisy units, control temperatures, and drafts. If you have questions on how to set up an IAQ program or plan, or any of the information discussed in this article, please contact the Trust’s Industrial Hygiene Consultant, Elizabeth Jakab, at ejakab@psesd.org. For additional information on loss control and industrial hygiene services available to your district, please visit our Client Relations resources page.